Beautiful 3 bedroom, 2 bath condo updated throughout in Southwester décor. This is a perfect home for your short or extend stay in the desert … light, bright, comfortable, with all the amenities home and is just steps from a heated pool and hot tub ... ideal for watching children or sneaking out with a glass of wine in the evenings. The living room features a vaulted ceiling, large sectional and mounted flat screen cable TV. There is a formal dining area that seats six and additional casual dining for four in the kitchen. The sunny kitchen overlooking the back patio has been updated and is fully stocked with cookware and serving ware for entertaining family and guests. Originally a three bedroom condo, the third bedroom has been furnished as a den with queen size sofa bed. This dual purpose room has a flat screen cable TV and a door that can be closed for sleeping privacy. The master bedroom is furnished with a comfortable king bed and quality bedding and has a flat screen cable TV. The on-suite has a walk-in shower. The guest bedroom is furnished with a comfortable queen size bed, quality bedding and flat screen TV. The guest bath has a combination tub/shower. The laundry room off the hallway has direct access to the garage. Owners have stored a golf cart in garage, so there is space for one car inside the garage and room for two cars in the driveway. Due to overhead storage, an SUV may not fit into the garage. This vacation home is located on a quiet cul-de-sac, this popular 30 Plan is an end unit with the back patio facing South overlooking a greenbelt, pool and spa. Rancho Las Palmas is centrally located close to El Paseo, College of the Desert and right across the street from “The River” with restaurants, shops and multi-plex movie theater. 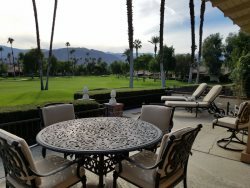 Rancho Las Palmas is surrounded by 27 holes of golf, 26 swimming pools and hot tubs and one of the most desirable tennis facilities in the area. Owners will consider dog guests but you must call first for pre-approval. There is a pet fee. Owner has a personal golf cart in the garage. Dogs may be accept with pre-approval. There is a pet fee. We had a wonderful vacation away and the house was perfect. Very spacious and tidy. The master bed was so comfy and the pillow were awesome, not the crappy cardboard ones. The couch was great too. We cooked everyday and found everything we needed. We left our pup home but happy it was pet friendly and that would have been an option. Thanks so much! This home was well situated for the activities we enjoy doing. It was very clean and the kitchen was supplied with lots of cookware and had everything we needed from blenders to utensils. The property managers were very responsive to any additional needs or maintenance items. would definitely rent with them again.